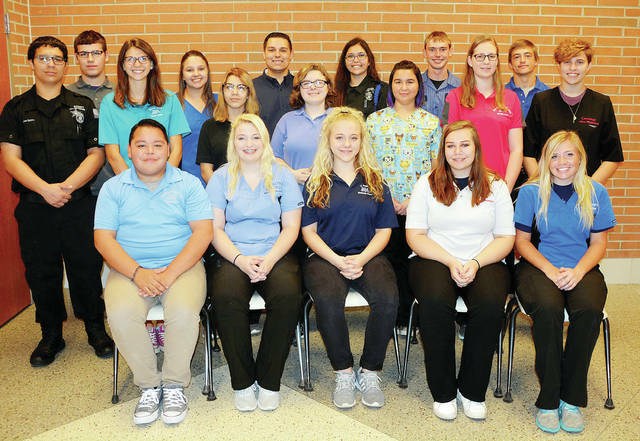 Four County Career Center in Archbold has selected its student ambassadors for the current school year. The senior students are chosen based on their teacher’s recommendations and leadership abilities. They represent the school in a variety of capacities including hosting future students, parents, area elected officials, and members of the community. The ambassadors are – front, from left – Andre Ramirez of Edgerton, Madisan Carpenter of Evergreen, McKenzie Reasor of Bryan, Hailey Shackelford of Fairview, Brookelyn Dye of Montpelier – middle, from left – Adam Rohrs of Tinora, Bailey Bowen of Edgerton, Kristina Minnich of Liberty Center, Summer Collins of Ayersville, Joslyn Tijerina of Archbold, Michelle Miller of Bryan, Alexis McCormick of Evergreen – back, from left – Dylan Anderson of Fayette, Emily Pippin of Liberty Center, Trenton Peluso of Evergreen, Mia Beltran of Delta, Eric Culler of Fairview, Vaughn Graber of Hicksville. Not pictured is Reese Knapp of Archbold. https://www.fcnews.org/wp-content/uploads/sites/45/2018/11/web1_student-ambassadors.jpgFour County Career Center in Archbold has selected its student ambassadors for the current school year. The senior students are chosen based on their teacher’s recommendations and leadership abilities. They represent the school in a variety of capacities including hosting future students, parents, area elected officials, and members of the community. The ambassadors are – front, from left – Andre Ramirez of Edgerton, Madisan Carpenter of Evergreen, McKenzie Reasor of Bryan, Hailey Shackelford of Fairview, Brookelyn Dye of Montpelier – middle, from left – Adam Rohrs of Tinora, Bailey Bowen of Edgerton, Kristina Minnich of Liberty Center, Summer Collins of Ayersville, Joslyn Tijerina of Archbold, Michelle Miller of Bryan, Alexis McCormick of Evergreen – back, from left – Dylan Anderson of Fayette, Emily Pippin of Liberty Center, Trenton Peluso of Evergreen, Mia Beltran of Delta, Eric Culler of Fairview, Vaughn Graber of Hicksville. Not pictured is Reese Knapp of Archbold.